Kerala VHSE Invited Supplementary Application for admission to VHSE plus One course 2018-19 in Kerala. The last date for application to VHSCAP/ VHSE Supplementary Allotment for admission to VHSE course will be 2-7-2018 4.0pm. The application form (Form 14A) will be available from the VHSE Schools in Kerala. VHSE Supplementary Allotment Application 2018 (VHSCAP) for admission to vhse courses has been started. The candidates who are looking for VHSE admission for the year 2018-19 can submit a fresh application though VHSCAP 2018 web site www.vhscap.kerala.gov.in. 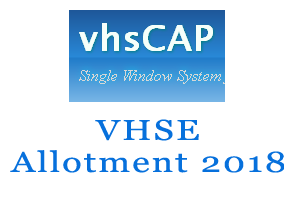 The candidates who are already applied for VHSE and does not get any allotment in the main allotment process can aslo apply by renew their VHSCAP application. 2. The candidates who were applied for VHSE Allotment but did not get involved in allotment process. 3. The candidates who get allotment but did not received the admission. (a) The fresh candidates can apply for VHSE supplementary Allotment 2018 by online registration. (b) The non-fresh candidates ie the candidates who are already applied for VHSE Allotment but did not get admission by any reason can renew their application. To renew the VHSCAP application, the candidates must use the “Form 14A – Application renewal form” available from the vhscap web site www.vhscap.kerala.gov.in or from the VHSE schools.